In a positon group with an ageless wonder and one of the game's best, the Vikings have built a strong foundation at cornerback. However, Daniel House says the development of Mackensie Alexander and Trae Waynes will dictate the performance of the Vikings' secondary in 2017. Updated: July 18, 2017, 2:30 p.m. In a position group with an ageless wonder and one of the game's best, the Vikings have built a strong foundation at cornerback. However, there are questions marks surrounding youth at the position. The cornerback group will need two young players to step up in more extended roles during the 2017 season. 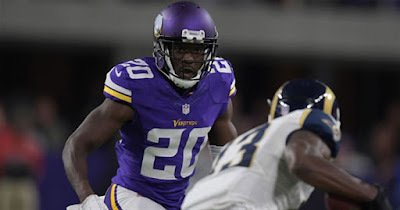 The Vikings have one of the best coverage cornerbacks in the game with Xavier Rhodes, but the spots surrounding him are uncertain. The departure of Captain Munnerlyn in free agency thrusts second-year cornerback Mackensie Alexander into the starting nickel cornerback role. In his rookie year, Alexander struggled with the transition to the next level. He picked up too many penalties and needed refinement in his technique. During mini-camp head coach Mike Zimmer indicated he has taken necessary strides this offseason. In fact, Zimmer even asked Alexander to speak with the incoming rookies during their orientation. Almost all young defensive backs need to be thrown into the fire to start growing as a player. The extended playing time in training camp and the preseason will be beneficial for Alexander to get comfortable in his new role. There may be growing pains associated with this, but the Vikings still have veteran Terence Newman, who can kick into the slot, if necessary. At 38 years old, Newman played in 72% of Minnesota’s snaps last year. Despite his age, he was effective, allowing the fewest yards per coverage snap (0.57) in 2016, according to Pro Football Focus. In addition, the Vikings will likely start Trae Waynes on the outside this year. Waynes tightened up his footwork, picked up less penalties, and relied less on his speed as a cornerback. Now, he needs to see more playing time to continue growing as a player. Nonetheless, in the event Waynes or Alexander struggle, the Vikings have an effective utility option with Terence Newman on the roster. In the fifth cornerback spot, it’s the age-old question: will former Gopher Marcus Sherels survive the final 53-man roster cut? The six-year veteran has quietly cemented himself as one of the top punter returners in the game. He was second behind Chiefs return man Tyreek Hill in punt return average (13.9). Sherels won’t provide significant value as a cornerback, but he is serviceable in the event injuries strike. More importantly, he is a strong veteran leader and can return kicks in a pinch. This year, there’s no uncertainty surrounding his roster spot, especially due to the holes on special teams. Outside of the top-five cornerback spots, there is less reliability at the position. Tre Roberson put together an impressive training camp as he made the transition from quarterback to cornerback in 2016. Roberson is a physical cornerback with evolving ball skills. However, he may still be rough around the edges when he’s thrust into an active role. Jabari Price missed last season with an injury, but has been rather undisciplined and inconsistent during his time on the field. If neither one of these players emerge, the team may decide to keep five cornerbacks with the idea that safety Jack Tocho can play cornerback. Tocho’s versatility leaves the Vikings with options when they make roster decisions on defense. The main concern about the cornerback position is second-tier depth. Minnesota could use one more skilled cornerback to provide stability in the event injuries occur. This is especially the case considering the Vikings don’t have a substantial amount of experience at the top of their depth chart. This league requires depth at the cornerback spot to keep up in a passing league. There aren’t many options on the free agent market either. The Vikings could sign a veteran free agent like Darrelle Revis, but it may not be worth the investment. Revis had a poor 2016 season and was released by Jets because of his inadequate performance. Revis claimed he lost weight to improve his speed issues. However, he turns 32 later this month and off-the-field drama surrounded him last year. Not to mention, Revis had effort issues last year and is on the downward turn of his career. The Vikings may be better suited to develop the youth they have and gamble that injuries don’t strike. Either way, Minnesota must see growth from past draft picks Trae Waynes and Mackensie Alexander, or the secondary will face growing pains. There is no reason to believe they won’t this year. The coaching duo of defensive backs coach Jerry Gray and Mike Zimmer provide more optimism that the Vikings have enough quality defensive backs and developmental products to be successful in 2017. However, the success at cornerback will be reliant upon if the position can stay healthy and receive consistent production from their youth.